"Mr. Helm, would you sign this? Thank you." To the best of my recollection (and perhaps slightly paraphrased), these are all the words I spoke to Levon Helm before his passing last Thursday at the age of 71. And, thus, the words he spoke to me were likely some variation of "Sure" three times and "You, t...Thanks!" (the latter I remember more clearly from last year's birthday Ramble). What I'm saying is we didn't have a lot of long talks. Or really more than a minute of direct interaction. So, why, when someone walking up the stairs of the Grove St. PATH station tapped me on the sleeve of my Levon Helm Band hoodie Thursday night and said, "Hey, nice sweatshirt," did I start to cry a little? Because music does that sometimes. Especially when it stops too soon. I came to The Band in a different way from most. My first exposure was to the post-Robbie, post-Richard version, via their cover of Bob Dylan's "When I Paint My Masterpiece" during the radio simulcast of the Bob Dylan 30th Anniversary Concert Celebration from Madison Square Garden and the subsequent TV airing on PBS. I was initially drawn to the harmonies and the one verse sung by the bassist Rick Danko (probably because of the guy incessantly yelling out, "Danko!" as The Band took the stage), but, over time, the main voice in the song--Levon's--was what hooked me for good. In fact, the last line of the song ("Someday everything's gonna be different, when I paint my masterpiece") was given the prime slot of being my high school yearbook quote. Credit was given to "BD" for the line, but if I had more space, I would've added an "As sung by LH." And then I worked my way backward, slowly at first. In fact, there was a long time where I actually had more post-Robbie studio albums than pre-Robbie ones. I still like Jericho (whose promo poster was one of the first wall decorations in my freshman dorm room) and High on the Hog a bunch, because those were the ones that got me in the door. And because the cover of Bruce Springsteen's "Atlantic City" on Jericho is one of the best covers ever. I also have a soft spot for one of the oddest covers in the Band catalog on High on the Hog, a version of En Vogue's "Free Your Mind" sung by Levon--and sung pretty damn well. Of course, there wasn't much Levon couldn't make you feel. In the days since Levon's passing, I've thought about how lucky I was to have the chance to see Levon play, whether it was with The Band in Central Park, at a free 4th of July show near Wall Street, or on the every borough of my birth (I actually worked as quasi-backstage-security; I had to have been terrible at that, but no one was killed, so I declare it a success); for a few Barnburners shows (including one on that consistently terrifying Blues Cruise around NYC); and, of course, quite a few Rambles. By my unofficial count, I saw Levon play 30 shows. A pretty good number. I just wish there had been time for a few more. I'm not the first person to say it (and this is surely not the first time I've said it), but there really was nothing like a Ramble at Levon's place. Sure, the Levon shows I saw at the Beacon Theatre, Radio City Music Hall, Newport, the State Theater in Ithaca, and elsewhere were great, but they didn't have that magic that the Woodstock Rambles had. That drive up Plochmann, which always seemed longer than you remembered but only because that anticipation was killing you (though I did walk up the road once and, I assure you, it's pretty long...and hilly). The way Levon's dogs, Lucy and Muddy, checked you out and, in Lucy's case, stood in the lake and barked at you. That wait on line, checking with the people around you to see if they were repeat Ramblers or first-timers about to have their minds blown. That moment when the doors opened and the measured (some times less measured than others) scramble for seats began. The buildup as the opening group wrapped up and the stage was prepped for Levon and his band. 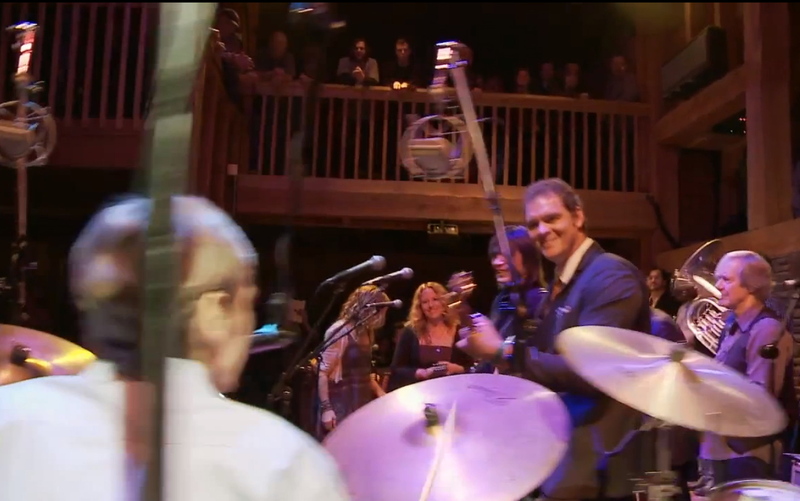 That billion-watt smile on Levon's face as he made his way to the drumkit. That joy that went through you with the first crack of the drums. And the triumphant walk back to the car after Levon had raised the arms of every musician on stage and headed back into his home. It was something. I tried hard to get everyone I loved, everyone who loved music to a Ramble. I did pretty good, but I wish I'd done better. Money got in the way. When most people dream of winning the lottery, they think about the vacations they will take and the giant houses they will buy. The first item on my postwin agenda was buying up as many seats as possible for a Ramble, paying the way for everyone I cared about (and flying them in if I had to), and having the greatest night of our lives. A house? What am I gonna do with a house? How could that bring more joy than the sight of Levon's ear-to-ear grin and the sound of that damn near perfect band, and sharing all that with the people I love? I tried. I bought my Powerball tickets. Every last one a loser. We'll have to come up with something else. It's hard to think about never seeing Levon behind those drums again, never again hearing that glorious yowl of a voice, a thing of beauty even when diminished. I could've seen Levon 1,000 times and still wanted to hear the 1,001st. It's just the way it is when you've heard something so powerful, so unbelievably true. For anyone who loves music and loves how it can pick you up and leave you in a much better place, a Levon Helm show--whether he was singing, drumming, or doing both--was about as good as it gets. There will never be another Levon Helm. Believe that. But there will be others. Others who sat with their ears up close to the speakers as Music from Big Pink played. Others who went to see Levon play his yearly free show at Gill's Farm in Hurley, NY, or at an outdoor festival because their folks thought they should hear this guy. Others who sat in Levon's barn at a Ramble and heard the most joyful noise this side of heaven and set out to make some righteous clamor of their own. Levon Helm's not here anymore. But he's not gonna die. It's not possible. "Hey, Levon, you know how in the later years, when you were having trouble singing and you'd finish a song where your voice started to waver a bit, and you'd put your thumb and forefinger just about together, as if to say, 'This close'? It didn't matter how your voice sounded. You were never 'this close.' You were always there. Right where you needed to be. Right on time. And I'm glad I got to see that. Goodbye. And thanks. So much."